Mjsolpac offer a variety of bespoke packaging inserts. These can be anything from fabric dunnage, routed foam, rigid dividers or a combination. 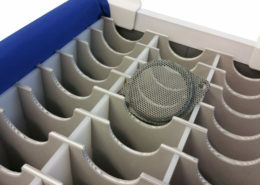 We can also provide inserts and fitting for those customers who wish to free issue their own branded containers. Bespoke foam is used to protect sensitive or smaller parts. These can be fitted into euro boxes or bespoke containers. 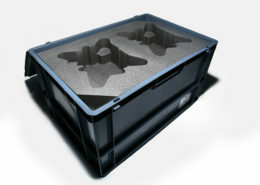 Foam will protect goods from movement during transit and storage. For our fabric dunnage we use a wide range of industrial fabrics in different weights. 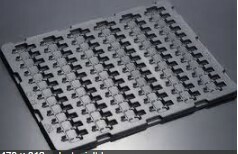 A flexible textile solution allows parts to nest together resulting in a much higher pack factor. 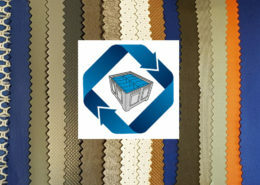 Fabric dunnage can be used in a variety of different containers from small euro boxes to steel stillages. We aim to supply the right product in the most suitable material for each particular product! Please click on the below portfolio images to see examples of our variety of packaging inserts.